Book Recommendation: "Off the Map"
James and Alex Turnbull are brothers who created the site and decided to publish a book with a sample of their content. They got permission to publish high quality prints of the satellite photos and the book is called "Off the Map - The Most Amazing Sights on Earth as Seen by Satellite". In the UK the same book will go by "Not in the Guide Book - The wackiest sights in Google Earth, as seen by Googlesightseeing.com". The book contains nearly 100 amazing sights of the Earth from satellite photos with information about each sight. The photos look fantastic on the page. It's still better to look at them with Google Earth, but it makes you better appreciate the quality of the photos to see them in print. Give this book out to folks who don't understand why you like Google Earth or Maps so much. The book is now available through Amazon, which you can buy here. I highly recommend it. I'm ordering a few for Christmas gifts! Hice un pequeño video (3 minutos) de demostración del nuevo mouse 3D de 3DConnexion: el SpaceNavigator™ para verlo en uso. El SpaceNavigator es el dispositivo más impresionante que pueden comprar para disfrutar a pleno de Google Earth (compren el SpaceNavigator PE en Amazon por menos del precio de lista de $59), y creo que cualquier fanático de GE quedará más que satisfecho. Lean mi revisión de producto del SpaceNavigator aquí. Vean otros videos en revisión de producto de OgleEarth sobre el SpaceNavigator. Estuve probando este periférico por un tiempo y me alegro de poder contarles ahora acerca de él! 3DConnexion, una compañía de Logitech (que fabrican teclados, mouses y otros periféricos de entrada), ha recientemente introducido al mercado el SpaceNavigator™ - un mouse tridemensional que ofrece a los diseñadores 3D y entusiastas, un control de navegación poderoso,suave e intuitivo para 3D. La mejor parte es que han trabajado con Google para asegurarse de que el aparato funcione bien tanto con Google Earth como con SketchUp (el mouse ya trabaja con varias aplicaciones 3D y programas de modelado). ¡Todos los fanáticos de Google Earth van a querer uno para estas Navidades! El SpaceNavigator es un periférico con conexión USB con una sólida base de acero inoxidable (pesada como para que no se mueva). Se instala un Driver y un programa que es su Panel de Control, y está listo para ser utilizado con GE 4. Se encuentr disponible tanto para plataformas Windows como para Mac OS. Les digo algo: este mouse es mi forma favorita de utilizar Google Earth. Con pequeños empujoncitos hacia arriba, adelanteI, atrás, giros, se podrán mover por Google Earth como si manejaran una cámara de cine. El SpaceNavigator no reemplaza el mouse tradicional. De hecho, pueden utilizar los dos al mismo tiempo e interactuar con ellos. Asombrosamente, este producto tiene un precio más que razonable para la versión personal: pueden obtener el SpaceNavigatorPE (Personal Edition) por sólo US$59, y para uso comercial, el SpaceNavigatorSE (Standard Edition) por sólo $99. Cuando adquieran este dispositivo, quedarán impresionados por su calidad en cuanto abran su caja. Dispositivos similares costaban cientos (inclusive miles) de dólares en el pasado. 3DConnexion también ha anunciado un versión premium del producto llamada SpaceExplorer™ que tiene más botones y posibilidades de configuración para el profesional 3D. El precio sugerido para este dispositivo es de US$299. Pero si sólo están buscando la mejor forma de moverse por Google Earth, el SpaceNavigator, a sólo US$59 será la mejor compra que puedan hacer. Por sólo US$40 más se puede acceder a la versión de uso comercial (para empresas). A propósito, los chicos de esta compañía son de primera clase..Su presidente, Rory Dooley, vino personalmente hasta Carolina del Norte a presentarme el producto así como también a Stefan Geens en Europa. Nos proveyó de material, información y trucos y consejos para utilizar el SpaceNavigator. Esta es una compañía que reconoce la importancia en el mercado de Google Earth, y son lo suficientemente inteligentes para reconocer también la importancia que tienen los blogs en cuanto a la difusión de lo relativo a este mercado. Creo que no pasará mucho tiempo para que todos los mundos virtuales 3D utilicen estos dispositvos, como SecondLife, VE3D, y WorldWind. ¡Todos querrán tener este bebé! Vean también el artículo de OgleEarth sobre el SpaceNavigator. Y el de JuicyGeography por Noel Jenkins. Bahrain - The Financial Times reports that Google Earth has been the catalyst for a push for equality in the country of Bahrain. Earlier this year, the government tried to censor the use of Google Earth (it was quickly put back after the ensuing outcry) when it was discovered people were looking at the lavish palaces and yachts owned by the elite of the country. More importantly, the elite own a very large disproportionate part of the real estate of the small country while most of the population live in a cramped life style. The satellite and aerial photos show the facts. Now there appears to be a push for change. Gaia - A programmer spent some time during the past few months hacking into the Google Earth databases so he could attempt to write an open source Google Earth application. First, this violates the terms of service of Google Earth (which specifically states you may not do this). Second, he didn't understand that the data is protected with encryption for a reason. Google has licenses with the data providers which require they restrict its use only through their application. If anyone could access the data, Google would not be able to provide it for free (also, the aerial and satellite photography companies would not be able to earn a business). It cost Google over $50 Million to get these data licenses. When Google Earth's Chief Technologist Michael Jones contacted the programmer this week, and gently explained the circumstances, he quickly removed the application from his servers. The programmer says: "Please note, that I did it on my own will, not being treated or something. Please do not consider me a victim. Michael explained the possible outcome of my work pretty good.". Liverpool - Some folks in Liverpool are disappointed their city isn't as up to date as London in Google Earth. This has been picked up by the media at The Guardian and the BBC. Google points out: "'We can only update things as soon as we have the data." In other words, if Liverpool wants better data - all they need to do is hire an aerial photographer and provide the resulting data to Google. That's what other cities, and even entire states, have done around the world. Several states in the US are now in high res because the states gave data to Google. New Google Earth Imagery and Terrain Data for Thanksgiving - Thanks! This morning, a terrain update occurred that corrects many of the holes in the SRTM data. This greatly improves the appearance of Mt. Everest, Matterhorn, and others in South America, Asia, and Europe. Time to go do the traditional American Thanksgiving holiday - visit with family and friends, eat lots of good food, watch movies, play games, and tell stories. In my case, we go to my Mom's house and there's usually about 30 or so, and about half are kids. It's one of my favorite holidays of the year. Anyway, here's hoping everyone has a good one as well. Check out my greeting card in Google Earth , and since Google Maps can now support most KMZ files as well - check it out in Google Maps as well. Google Maps Supports More KML - Google announced yesterday at the Google Maps API that they are now supporting more KML features in Google Maps. In particular, they now support image overlays. 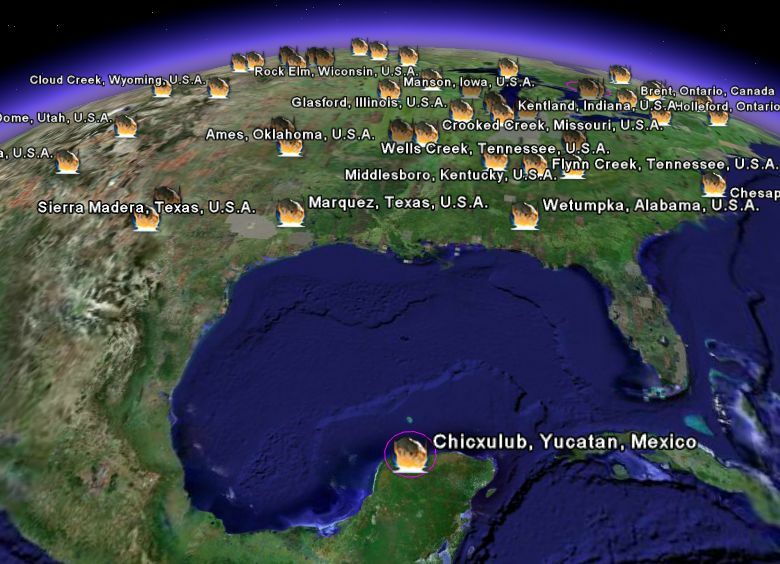 This means you can show things like the famous Maxim cover of Eva Longoria in Google Maps as well as in Google Earth. Not only that, but Google now has a "View in Google Maps" option when you are looking at posts at the Google Earth Community! Check out this post I did last year for a high resolution photo of Hurricane Wilma. It works in Google Maps (make sure you zoom way out) or in GE. A couple of features I'd like to see added: Ability to turn off a placemark/overlay, and ability to change transparency. But, you can always go to Google Earth and do that. San Jose's GIS organization has put together a city plan presentation using Google Earth. They even have modeled many of their buildings in 3D. Right now, they are only releasing a video (not the GE files). Here's a link to the high resolution video (56 Mbyte WMV file). Thanks to Greg from SJ GIS. Next year's Where 2.0 has released its Call For Papers. Proposals are due by January 5th. The conference will be held May 29-30, 2007 at the Fairmont Hotel in San Jose, CA (same place as last year). A few days ago, on November 16th, a large horizontal construction crane collapsed in Bellevue, Washington, killing one person in his fourth story apartment (a Microsoft employee who had only been with the company 5 months). The operator of the crane in his cage fell about 200 feet, but apparently survived with only minor scratches. 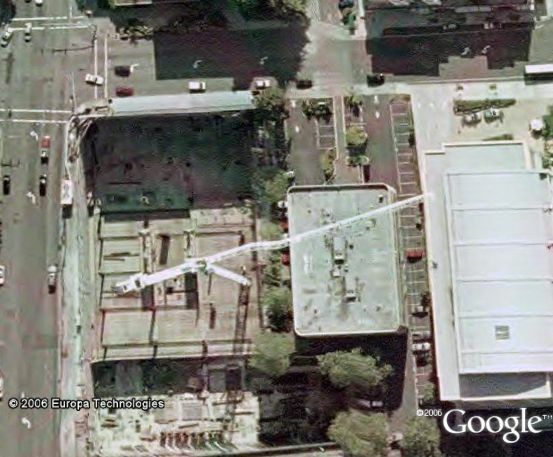 Interestingly, the same crane is apparently viewable in Google Earth. The Digital Globe satellite photos of the area are dated August 20, 2006. And the crane has been in the area for a few months. One of the Google Earth Community moderators, 'chief_sparky', has posted some placemarks showing the crane and the damaged buildings in the area. You can read the news story about the disaster here, and a photo of one of the destroyed buildings. As of Saturday, a reason for the collapse had not been determined. Apparently, the crane had been moved from the location shown in the satellite photo, slightly to the east where the collapse occurred. It's fascinating to see the subject of a news report in a 3 month old high resolution satellite photos. Here is 'chief_sparky's post. One unexpected benefit with the new time animation feature in GE 4 is the new life it has breathed into 3D models. 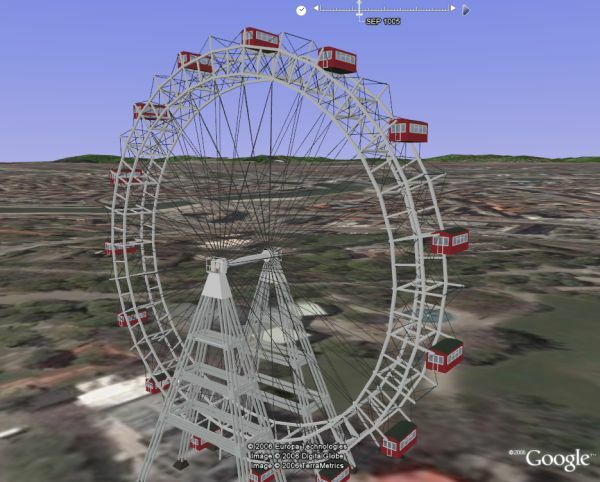 A couple of the regular Google Earth 3D model innovators have been doing a number of interesting things like this new Ferris Wheel animation by 'barnabu' who posted this at the Google Earth Community. After you load it (you must have a recent version of GE 4 - version 4.0.2091 or greater), you should see the time slider gadget in the upper part of your screen. You may need to adjust your view slightly to see the models properly. Make sure the slider is set to its smallest size. Select the triangular-shaped right arrow play button on the right side of the time gadget to start the animation. The first time through it has to load the sequence. Select the clock button on the left to bring up a panel to adjust the "Animation Speed". Another neat example, just posted by 'jpwade' at the GEC is an animation showing a ship passing through the Panama Canal. . Once again hit the time animation play button (as described above). If you zoom in to the canal while it is animating you can see the gates open and close, the water rise, and the ship move through. These guys are just having too much fun I think! Este es el agregado de Versión 2.0 de Blue Marble como imagen superpuesta de la Tierra creada por la NASA llamada la Próxima Generación de Blue Marble vista desde el espacio en Google Earth. Cuando te acercas a la Tierra, la imagen de Blue Marble va desapareciendo, permitiendo así ver las fotos satelitales de Google. Esta versión tiene algunas mejoras importantes. Tienes que tener la versión 4 de GE (versión 4.0.2413 o superior) para que trabaje correctamente. Puedes también habilitar la capa de Nubes en Tiempo Real (se actualiza cada 3 horas). Las nubes están activadas por defecto asi que cargan rápido cuando abres GE. Esta versión trabaja mucho más rápido porque utiliza las características de KML 2.1 para detectar cuándo hacer transparente las imágenes. Fué publicada la semana pasada utilizando un vínculo de red para comunicarse correctamente con el servidor. Pongan la carpeta "BlueMarble" en "Mis Lugares" para tenerla a mano permanentemente. A propósito, verán una versión diferente de la Tierra cada mes - vean esta Animación de Blue Marble para más información. Pruébenla a ver si concuerdan conmigo en que Google debería implementarla sobre la Tierra! Enseguida después de su publicación la semana pasada, la gente de Google me sugirió que probara esta nueva característica del KML 2.1 para implementarla. Barry Hunter (quien trabajó conmigo en este proyecto) ha hecho algo con KML 2.1 cuando salió en la primavera pasada, pero no funcionó como se esperaba por lo que utilizamos un acercamiento hecho con un vínculo de red tipo cliente/servidor. (NOTA: la versión que publicamos la semana pasada tiene la ventaja de funcionar en la vieja versión de GE). Pueden encontrar imágenes de la NASA de la Nueva Generación Blue Marble aquí. Gracias a Barry Hunter de Nearby por haber trabajado conmigo en este proyecto. This week I spent some time setting up a new desktop with a new high-end video card. With this new system, I felt I could afford to turn on more graphics settings for 3D applications. I knew that these settings could improve the look of Google Earth - I occasionally would use this on my old box to make screenshots. 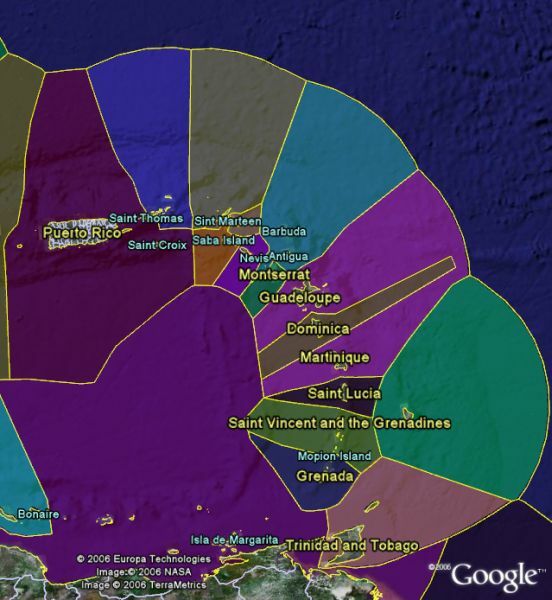 But, using these settings while interactively viewing Google Earth is just awesome! It makes viewing the earth even more beautiful. Oh, and 3D models in GE look MUCH better with these settings. It's hard to see in the scaled-down comparison above, but the clarity improvement of these two airport shots is pretty obvious even here. If you have a relatively new video card which is ranked well for 3D gaming then you should try these tips out. Note: you should try each of these tips one at a time. See how each one effects the speed of update when you move around GE. If one of them slows things down a lot, you might want to avoid using it except when you want to to do a screenshot. Detail Area - From within Google Earth, go to "Tools -> Options". On the "3D View" pane you should choose "Detail Area" to "Large" (unless you are running your screen at a low resolution - if you're doing this, you're wasting a good video card). Anisotropic Filtering - On the same "3D View" pane as above, try setting "Anisotropic Filtering" to "High". If it slows things down too much, try "Medium". This setting will greatly improve your view when you are looking at an angle (say down a runway at an airport, or at distant mountains). More details will be visible - things will seem clearer. Anti-Aliasing - Anti-aliasing is a technique used to reduce the appearance of jagged lines caused by pixels (which are square) when drawing a line at an angle. GE doesn't currently have a setting for this, so you will have to turn it on using your video card's settings (the method varies depending on your card). Look for the control panel application for your video card. Find the settings for "Anti-Aliasing" and start with the lowest setting. Try higher settings if it doesn't seem to impact your graphics performance. NOTE: If you turn this on (instead of allowing applications to control it) all 3D applications will be affected. Also, you should close Google Earth and reopen it after changing the setting or the setting may not take effect. Once you have it on, turn on a vector layer like "Roads" or "Borders" in GE. You should see a great improvement verses looking at them without anti-aliasing. You may have heard about the KFC Logo set up in the Nevada desert which, according to a press release from KFC, is supposedly the first logo "visible from space". Well, in reality this is a carefully crafted publicity stunt designed to have a viral marketing effect. Which, with my post here, I guess I'm contributing. :-) However, here's an important point: I think KFC really messed up by not making a high resolution aerial photo of the site available in the form of an image overlay and released as a Google Earth file. That's what Maxim did for a giant version of one of their covers with Eva Longoria in a bathing suit. Fortunately, someone from the GEC community called 'mysterytrain' did manage to grab a photo of the aerial shot of the KFC logo and has overlayed it in Google Earth . As you can see, the KFC logo was way too small to be visible from space unless you have a telescope. Looks like the logo is about 325 feet tall. I really hate it when publicity stunts are done like this and the PR people basically lie, or just make something up to get attention. But, I guess that was part of the viral marketing strategy. I did notice they had the GeoEye satellite company take a picture of the site. From the video (which you can see from the KFC web site) of the making of the KFC logo, it looks like somebody put it into Microsoft's Virtual Earth 3D. Has anyone found this released for VE3D? It's not surprising Microsoft would be invovled since they have a partnership with GeoEye. From a Google Video of the logo it was funny to see that a helicopter taking video accidentally got too close and messed up the logo (see the very end of the video). Tagzania Update - Tagzania is an excellent Google Maps mashup which lets you mark places, tag them, and easily share the locations with anyone. You can even easily embed your own Google Maps in your blog/web site. I especially like that they fully support Google Earth as well. They have just posted in their blog that they have added support for two other virtual globes - Microsofts Virtual Earth 3D, and NASA's World Wind. So, now you can choose the KML button for Google Earth, or two other options to view tagged locations in 3D worlds. 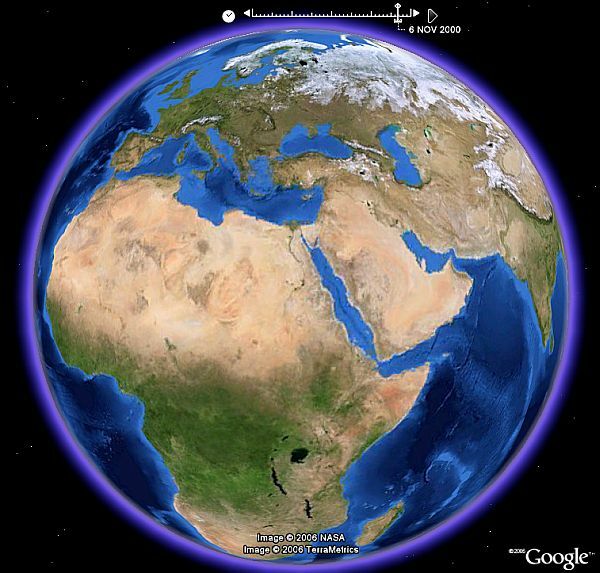 Teacher Aid - Educause has posted a PDF document called "7 Things You Should Know About Google Earth". This is a well-written summary giving a basic overview of reasons for using Google Earth in education. But, as a PDF document with no links, it doesn't take the teacher to the next step. via OgleEarth. 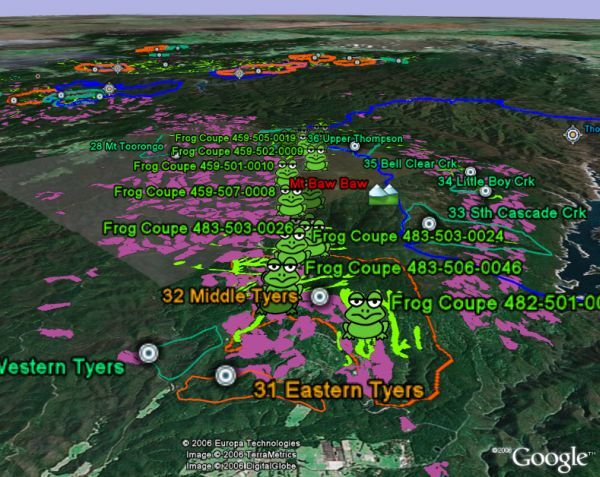 For more information on educational uses of Google Earth, read this article. Bill Gates Says "Google Earth is Fantastic!" "I've been told that Google is the company most like ours. That may be true. Well, we overlap in a lot of areas. We're both software companies, so we're competing on a lot of levels. They hire a lot of smart people, we hire a lot of smart people. 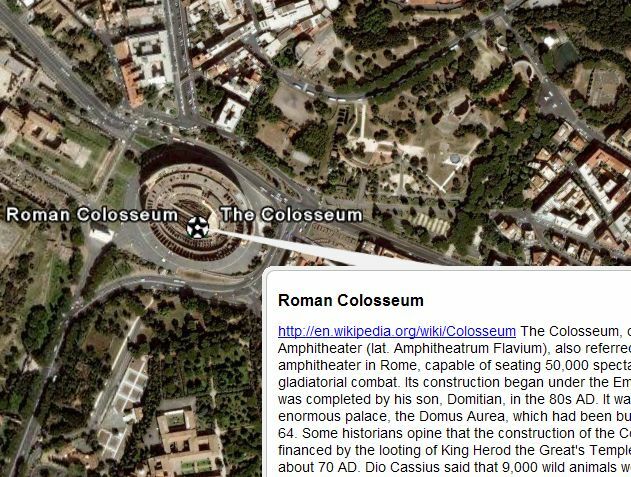 Google Earth is fantastic; what they do is free and a huge benefit to all. They're very good at knowing how to use high traffic at their sites and turning it into profit." Last year NASA released Blue Marble Next Generation which are cloudless color-enhanced images of the entire Earth. Even better, they released one complete view of the Earth for every month of the year. You can watch how the Earth changes over time during the course of the year. The images are available in a variety of resolutions, and I have done experiments with them in Google Earth. Today I'm releasing a time animation of NASA's Blue Marble (5.4 Mbytes) over 12 months where the images are overlayed on Google Earth. You must be using Google Earth 4 version 4.0.2091 or greater to see the time animation. Read on for details on how to use it. I color-enhanced the photos, reduced the size, time stamped them for each corresponding month, and overlayed them in Google Earth. Once it loads, you will see the time gadget in the upper part of the screen. Select the rightmost "Play" button (the triangular button) to see it animate. Note that it will have to load each of the months the first time through, after that it should animate more quickly. Also, I recommend you speed up the animation by selecting the little "clock" gadget on the left of the time gadget. Move the slider called "Animation Speed" to at least half way for a faster animation. You can also spin the Earth, while its animating, to see other parts of the world over time. The images came from NASA's Blue Marble Next Generation web page here. There are very high resolution versions of the images available. The New York Times reports today on some research being done using Google Earth to help identify new impact craters which may point to a higher frequency of large impacts than previously theorized. A group called the "Holocene Impact Working Group" believe there have been multiple large impacts within the last 10,000 years whereas most astronomers have believed there haven't been any in longer than that. The new group believes there is evidence of multiple strikes which landed in the ocean. After all, the Earth's surface is 75% water - so this isn't surprising. The researchers have been looking for signs on land using Google Earth in the form of "chevrons" which are enormous wedge-shaped sediment deposits. Often these chevrons have fossilized ocean materials and it is believed they are formed by enormous super-tsunamis which resulted from large meteor impacts in the ocean. Already the group has identified several locations dated less than 10,000 years ago which have strong evidence of having been the result of impacts. They have also examined ocean floor data and identified the suspected impact locations themselves. They have taken soil samples from one location and found evidence of melted material only found in impact sites. The group who has put forward the theory will be presenting at the American Geophysical Union (AGU) meeting in December. I'm planning to attend the AGU virtual globes meetings and will report if more interesting news is revealed. In the meantime, you might want to check out this collection of 172 large impact crater sites. Also, you might be interested in this story about a recently discovered crater which is easily visible in GE. You can also reach the tutorials from within GE by choosing "Help -> Tutorials". After the release this weekend of some new featured layers, many folks in the news media and the blogosphere have been raving about Google Earth's "new" capability to do the 4th dimension: time. The new layer mentioned is the Rumsey Historical Maps Layer (viewable only if you use the latest Google Earth 4 - download here). The historical maps are pretty cool and everything. But, it's not really a new feature per se (the technique for viewing really large images is the real new feature). You could download historical maps and view them overlayed over the Earth even in the first version of GE (see this 1666 map of London for example). 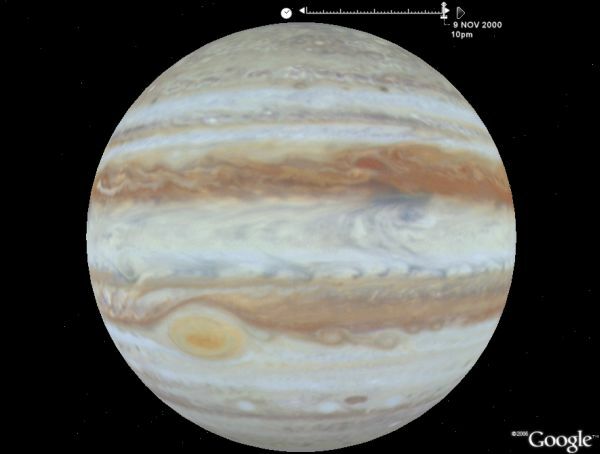 Jupiter Clouds in Motion - that's right, turn Earth into Jupiter and watch the clouds move! 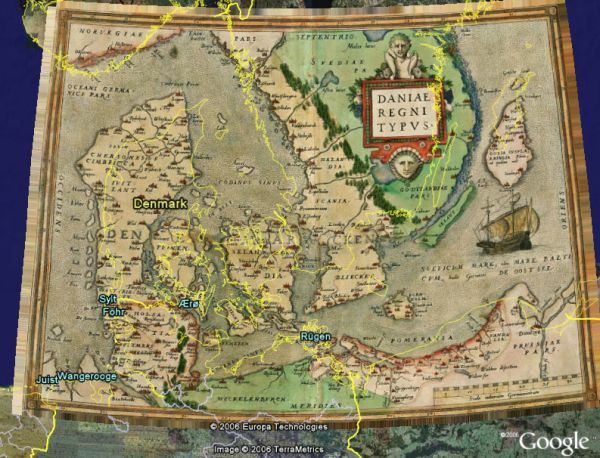 Rumsey Historical Maps - This is a collection of historical maps which you can overlay over their location on Earth. If you are not running Google Earth 4, you will not see this layer. Open the folder and turn on the map that interests you. The first link shows you the locations of the different map and each description gives you a few details. You can then turn on each map and they will be overlayed in GE. The maps are "regionated" which means they will load more detail as you get closer (it also means the images are scanned at a very high resolution). I'm sure some of my mapping friends like Jonathan Crowe will be curious to see these. See Rumsey's Google blog entry about the maps. Tracks4Africa - this is my favorite of the new layers. 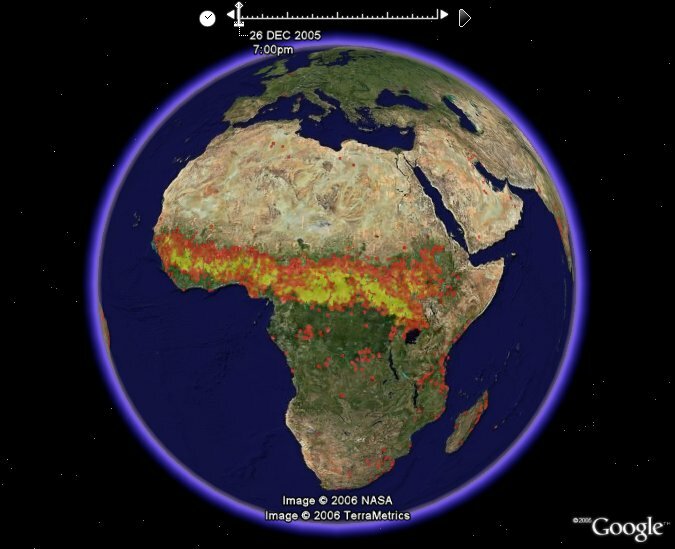 There are maps of places to go in Africa built by compiling data from GSP tracks. The layer also has lots useful information and photos. Zoom in closer to see more detail. You can read more, and buy the maps for your GPS, by going to Tracks4Africa's web site. 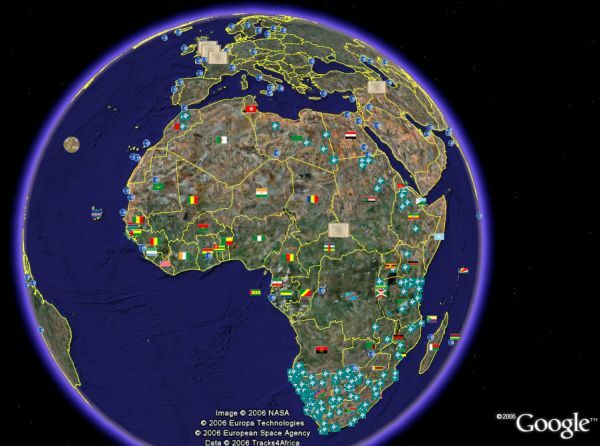 Spotlight on Africa - This is a collection of placemarks showing the flag of each country of Africa. 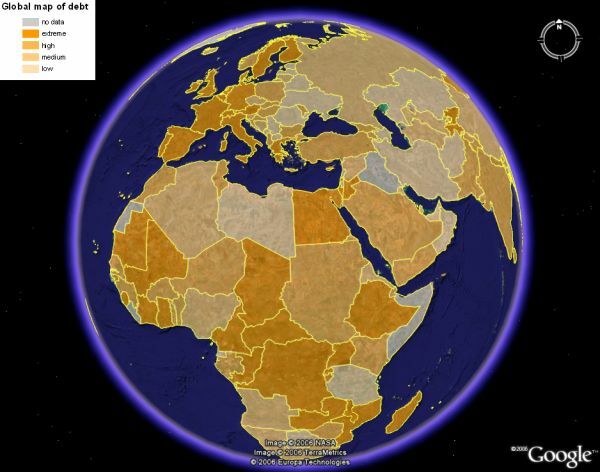 The placemark description includes an overview of basic information of each country from the CIA World Factbook. The placemarks were developed by the National Geographic My Wonderful World campaign to help kids become more geographically aware. This is nicely done, but you can see the whole world done in a similar fashion in this collection. European Space Agency - this layer shows ESA logo placemarks of different locations where a satellite photo can be viewed of that location. A small picture is in the placemark description, and a link to a page where you can see a larger picture. I am disappointed that you can't just view the larger pictures overlayed in Google Earth though. 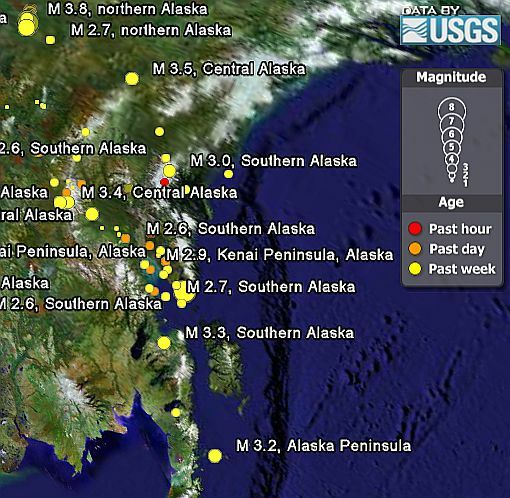 Earthquakes are happening around the world all the time, we just can't feel all of them. The US Geological Survey (USGS) is constantly monitoring the Earth with sensitive instruments and for some time now has offered ways of sharing their data on the web through their Earthquake Hazards Program. Last February I reported on their new Google Earth earthquake monitoring features. They have recently refined the interface and in addition to real-time seismic activity world-wide, they now show faultlines, tectonic plate boundaries, and convergence points for faults with colored lines on the Earth (there's a key to the colors in the places folder). I'm travelling at the moment, so I don't have a time to show a new screenshot, but check out the USGS Earthquake monitoring network link. This is a nice improvement to an already amazing tool to monitor geologic activity of the Earth. It is in my permanent places folder. Thanks to a GEB reader who I only know as "GE_fan" for letting me know about the update. 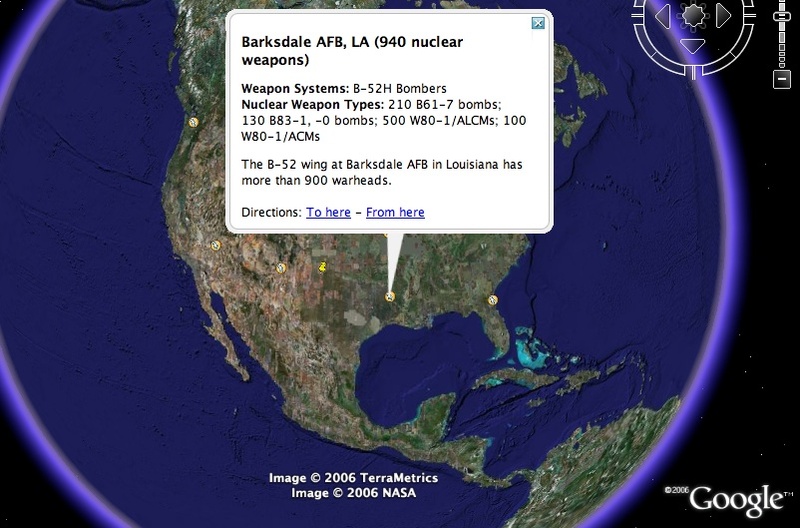 Defensetech.org blogs about a new Google Earth file showing the location and size of nuclear stockpiles of the US (nearly 10,000 of them). The file was put together by the Natural Resources Defense Council and the Federation of American Scientists using publicly available information. Read the first link above for details about this collection, or just go check out the GE file to see the bombs nearest you (at least the ones from the US). Please note the placemark collection doesn't include the bombs currently moving around in planes and submarines all over the world. Or the ones whose locations are secret. It would be interesting to see the locations of bombs from all the other nuclear powered nations. Here's another useful related file 2000+ Nuclear Bomb Test sites posted by 'Hill' at the GEC. And let's not forget the North Korean bomb test location. 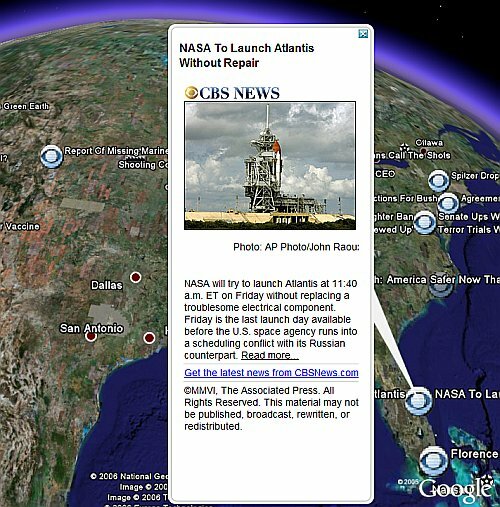 Back in September I wrote about CBS News supporting Google Earth with georeferenced RSS news stories. The only problem was their link was not set up as a network link so you wouldn't get the news delivered automatically (unless you set up the network link yourself). I sent them feedback about this months ago. Anyway, sometime within the last month they finally updated the file as a network link. Even more significantly, the new version of Google Earth 4 (4.0.24xx+) which came out November 1st, really makes this CBS News link more useful. They put a lot of stories in the same city (Washington, DC, NYC). Now when you click on placemarks on the same city they spread out into a star pattern allowing you to see all the stories from that location. By the way, the news stories are usually accompanied by nice relevant photos and a link to more details. Often video accompanies the stories once you go to their web page. Very professional multimedia content. I can now recommend keeping the CBS News network link in your permanent Places folder (it won't take up much room except when you turn it on). The link comes from their impressive array of RSS feeds. Here's the main Wikipedia article, and here's the post at the Google Earth Community by 'ink_polaroid'. Yesterday I made some initial comments on the new Microsoft Virtual Earth 3D (VE3D). 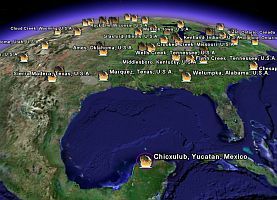 I had expectations that Microsoft's first release of Virtual Earth 3D would be a big event which would spawn really strong competition between Google and Microsoft. Since I wasn't able to run the program, I was disappointed, and reacted accordingly. No apologies though. I have now had a chance to play with VE3D (on another computer) and I do see some positives. 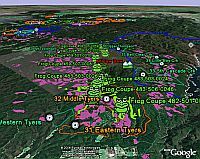 However, VE3D's first beta is a long way from having the breadth of features developed in Google Earth over the past several years (GE was a product called Keyhole before Google bought it in 2004). Even Microsoft recognizes this (according to at least one of VE3D's developers). By the way, I think strong competition from other players in the virtual globe application field will ultimately be to the benefit to all of us wanting to use them. After all, if it drives Google, Microsoft and other companies to make even better products and data for free, we all win. There are several virtual globes out there: NASA Worldwind, SkylineGlobe, EarthSlot, and Celestia - to name a few. Another significant one is coming out soon from GIS software maker ESRI called ArcGIS Explorer. Now, since I've had a chance to use the new VE3D application for a few hours let me share some more thoughts. VE3D definitely qualifies as a virtual globe, and has some very nice features. The addition of complete cities with photo-realistic 3D buildings is definitely superior to any the built-in cities currently available in Google Earth. Kudos to Microsoft for doing this, and I look forward to seeing more cities. However, GE 4 is certainly able to display 3D cities with the same or better quality. And Worldwind, SkylineGlobe, and soon ArcGIS Explorer, can render textured buildings as well. When someone figures out a way to transfer the VE3D building models over to GE's KMZ file format, it will of course help all virtual globes supporting KMZ be able to view the buildings as well (assuming Microsoft would allow it). 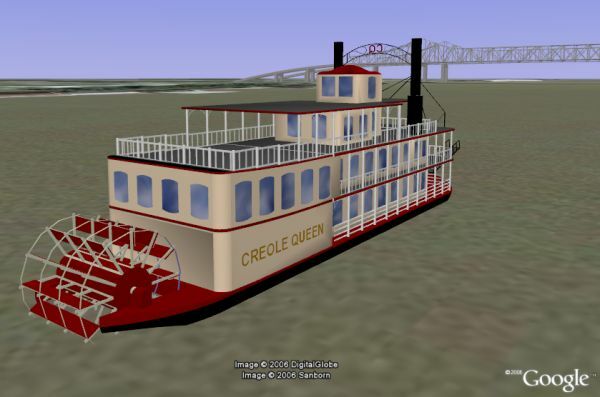 Of course, if VE3D supports 3D KMZ files they would be able to use KMZ-based 3D models from Google's 3DWarehouse. And then everyone would have more photo-realistic 3D buildings. The decision to build VE3D as a modular system is definitely a smart move allowing VE3D to be used as either a plug-in for a browser, or as a separate application. I'm sure someone will develop plug-ins allowing it to be used in other browsers on Windows. However, the real question is whether VE3D can be easily ported to other OSes like the Mac or Linux. And, I still think it was very Microsoft-like (and uncool) to only release VE3D supporting IE and not at least Firefox. The interface for moving around the 3D world in VE3D I sometimes found awkward. Having to hold down both the CTRL key and the left mouse button to pan and tilt the view? Why not just make it work with the middle mouse like GE (and other 3D programs)? I haven't tried the alternative controller interface (gamepads, joysticks, etc.). But, I assume it is similar to the ones in Google Earth 4. The level of detail presented in VE3D is often less than it should be. For example, VE3D will load low-res satellite views even when higher res photos are available when viewed at an angle/tilt (i.e. further away scenery doesn't load realistic photos). This is more bandwidth efficient, but negatively impacts the quality of scenery. Also, can you turn off the buildings in the 3D mode? I'd like to see the real photos sometimes instead of the 3D buildings, while still seeing the surrounding terrain in 3D. I couldn't find this option. This is just an opinion, but I think it was tacky deciding to start out with big virtual billboard ads with VE3D's first public beta release. On my brand new laptop, it takes just a bit longer to load both IE and then the VE3D module than it does to load GE. The installation process for VE3D is a fair bit longer and has several more steps (especially if you haven't already loaded .Net 2.0). I'm glad VE3D is out at last. I've been expecting Microsoft to release something for months. The VE3D cities are really cool. And, I like the bird's eye view photos as well. I'm sure Microsoft's 3D building technology will enable more cities to be developed rapidly. One of the Microsoft people interviewed said the company has invested hundreds of millions of dollars in technology for Virtual Earth. I imagine this means even more good things will be coming for Virtual Earth 3D in the near future. Let's face it - virtual globes are just going to continue to get better and better. Future versions of Microsoft's VE3D will definitely keep Google on their toes. But, as it stands so far I don't think a lot of people will stop using GE because of this release. Google Earth has much more in features, more information, more imagery, more user-contributed data, more international data, and a much wider and larger audience. But, I'm not going to do a side-by-side comparison yet. It's too early at this stage. A while back I mentioned this collection, but never properly did a dedicated blog entry on it. Crop Circles are formed by "stomping" down crop vegetation to form shapes when viewed from the air. There is a collection of placemarks which show some interesting crop circles around the world (this collection currently shows mostly those in the UK). 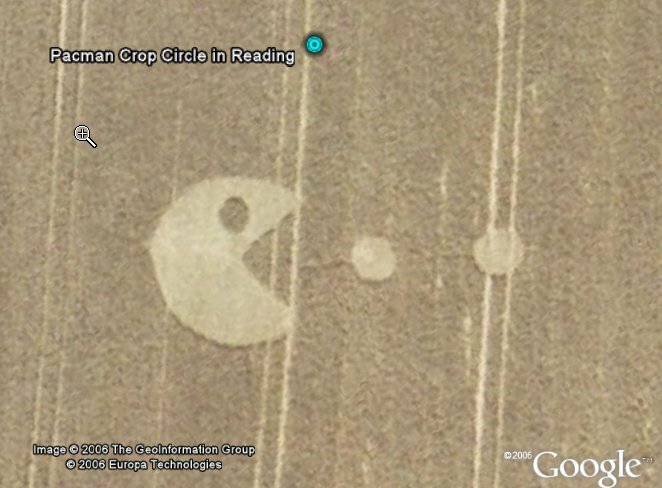 One of the most popular in the collection is the "Pac Man" crop circle (as shown in the screenshot). If you know of other crop circles, you should post them to the forum thread here which is maintained by 'Cyclonic' (who also does the planes in flight collection). Here's an interesting web site about people who create crop circles with instructions on how to go about it - circlemakers.org. Today Microsoft has released 3D capability to Virtual Earth (local.live.com). They are saying they don't require you to run a separate application (although, since you have to download and install a 5 Mbyte browser plug-in, I don't see that as exactly true). Once you have the required plug-in, turn on ActiveX controls, and meet other system requirements, you can run it in your Internet Explorer. I'd like to say I tried the new Virtual Earth 3D feature. But, unfortunately I can't run it. It requires Internet Explorer 6 or 7 (I only run Firefox). And, it requires Windows XP SP2 (for a variety of reasons I only use SP1 on my primary 3D desktop - and for security reasons is why I don't run IE). Also, of course, if you use a Mac or Linux you can't use it. One nice thing Microsoft has implemented in the new 3D feature (based on a video demonstration and screenshots published by CNET) is photo-based textured 3D buildings for 15 cities. The city shown does indeed look quite good in the VE 3D demonstration, and - as we've seen with GE 4 - photo textured buildings are much better than the plain gray 3D buildings shown in GE for 38 cities (plus many cities in Japan). The CNET video reviewer gets some facts wrong: Google Earth can show photo-realistic buildings, and you don't need to use Google Maps to see road maps or any of the dozens of other layers of information built-in to Google Earth (which are unmatched by Microsoft or anyone else). Anyway, with all the limitations (IE, XP SP2, plug-in, etc.) I don't really see this as a big threat to Google Earth. But, Microsoft does continue to nibble away at the unique features provided by Google Earth - at least in theory. If you are a Microsoft devotee, I guess you will be happy. But, if you are a Mac/Linux/Firefox/Opera type - forget it. The LA Times published a story a few days ago called "Architects change their view of the lowly roof". Partly due to the popularity of looking at buildings from directly above (thanks to Google Earth), architects are now viewing the tops of buildings as the "fifth facade". A place to get creative and decorate for those millions of people world-wide who may view your buildings from above. The article mentions the new de Young museum roof in San Francisco for example (which is viewable under construction in Google Earth). Some architects are creating new "green roofs" which have gardens or parks on the top. Architects report that clients are regularly appearing making requests based on views they have gathered from Google Earth. Architecture students are regularly using Google Earth, especially since the addition of the 3D modeling program SketchUp. "My students use Google Earth obsessively, especially now that it includes SketchUp," said Paul Preissner, a Chicago architect who is teaching this fall at the University of Nebraska. The newspaper also refers to the huge hotel / real estate developments offshore in Dubai. 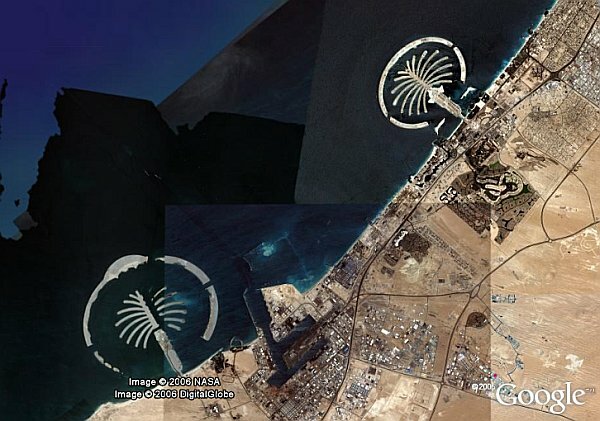 Here's a collection of placemarks and aerial photo overlays documenting the various projects in Dubai (which was posted at the GEC). 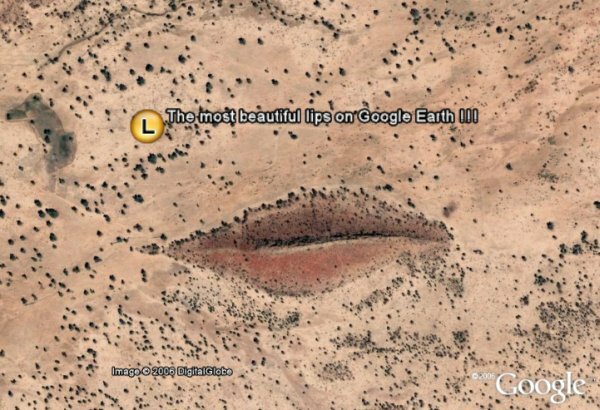 Last month someone at the Google Earth Community called 'atlas1970' discovered the "most beautiful lips on Earth!!!". They might quite possibly be the biggest lips (even bigger than Angelina Jolie's). These lips measure out at just short of 1 kilometer wide. You can check out the lips here in Google Earth , or in Google Maps in the satellite photo. You should definitely take a closer look. It's amazing how they still look like lips even zoomed close. Before someone asks, there is NO photo-retouching involved. Why not hook up your rowing machine and practice rowing your favorite river from the comfort of your exercise room? That's what these guys did. They wrote an application to interface between a Concept II PM3 (see picture) using a USB cable and Google Earth so you can then row yourself down the river. This is a great concept, but could use some more innovation to make it more practical. Right now it apparently just shows a view of the river as you row yourself along. You could show a boat icon with your position, show your track, put up your current speed and distance to finish, etc. In fact, you could use the new time features in GE 4 to show animations of your previous runs. This tool enables you to do familiarization with a new river before you even get there in person (the same way I use GE or a flight simulator for familiarization before I fly to a new airport). Of course, you could also do fun things like row the Grand Canyon, go down 5th avenue in NYC, or do the Pacific Ocean! :-) via OgleEarth. My friends James and Alex Turnbull, who write GoogleSightseeing.com, have been busy turning their work into a book which is called "Off the Map - The Most Amazing Sights on Earth as Seen by Satellite". In the UK the same book will go by "Not in the Guide Book - The wackiest sights in Google Earth, as seen by Googlesightseeing.com". The book contains nearly 100 amazing sights of the Earth from satelllite photos with information about each sight. The book is now available through Amazon, which you can order here. What do these things have in common? As mentioned in September, Google has been quietly adding realistic high-quality 3D models of buildings to the Google 3DWarehouse. They have a number of the Major League Baseball stadiums available for Google Earth 4 (make sure you download the latest version of GE which was just released November 1st). Apparently the stadium management liked it enough they have shown it on their big screen during games. The stadium video (and others like it) were produced by Ricardo Andrade and David Sabin at Transvideo. The MLB stadiums were built by modeling pros at Google's SketchUp. 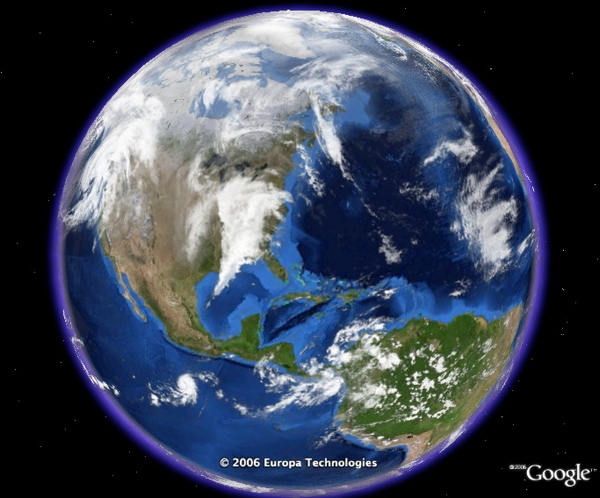 Transvideo specializes in optimizing Google Earth animations for video and broadcast, both in SD and HD formats. I know Google has also used them for other projects like this X PRIZE Cup video. And they did the video seen at Google's keynote at CES show back in January. Recently Google added a movie making capability to the basic Google Earth Pro (the movie module formerly cost an extra $200). You can definitely make good quality videos for viewing online. However, there are many techniques required to make a professional rendering of broadcast quality. Transvideo is one outfit with demonstrated experience. New Google Earth 4 (beta) Released - November 1st - More Features Added to Free Version! 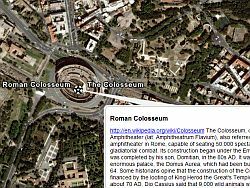 Google has just released a new Google Earth 4 beta with several new features. On Windows the new version number is 4.0.2416. The Mac version is 4.0.2413. I've got a few details on what's new here, I'll add more as I learn what else is there. The biggest news is that two features formerly only available in the GE Plus version (which costs $20/year) are now available in the free version. You can now draw paths and polygons with the new free GE 4. Other new features include: new icons for placemarks, faster loading 3D models, improved lighting for 3D models (much better), and printing of driving directions and folders. See Google's new page about the update. The time feature implemented in the last version has been refined. You can now slow things down better, you can restrict the time slider to the current folder, and you can now choose "Bounce" for the animation instead of just "Wrap" or "Once". The screenshot on the right shows the new icons. The interface provides options to store custom icons for easy later selection. Also, placemark icons that are close together will move apart (with a slick animation) when clicked on allowing you to easily select the one you want. A very important new feature is that image overlays can now have altitude. This means weather satellite photos and other weather images can be placed above the ground. When you zoom in, the overlay will disappear allowing you to view the ground photos without interference. I really love the "Global Clouds" when you add altitude to it (edit the properties for the Global Cloud image overlay, select "Altitude" and move it up towards space). Very cool! Google is apparently re-evaluating the line-up of features for all the versions. Last month they added new capabilities to the GE Pro version at no charge. Those of you with GE Plus can probably expect new features in the next release of that version (according to my sources). This new release makes some important refinements bringing the GE 4 beta closer to readiness for official release. I suspect GE 4 will go out of beta before the end of the year if all goes well with this beta. If you haven't already downloaded GE 4, you should definitely download it now. Google's download page doesn't even encourage downloading the old GE 3 version any more. 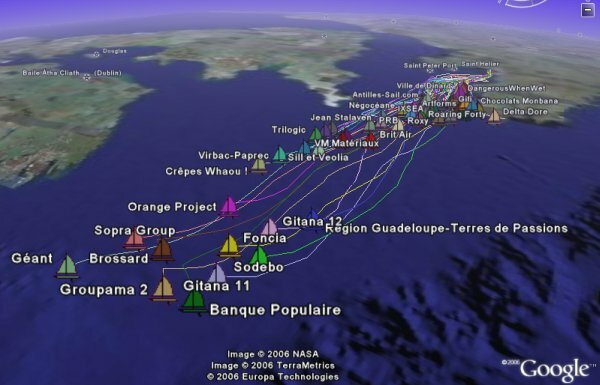 The Route du Rhum is a solo sailing race from France to Guadaloupe in the Caribbean which is held every four years. It just started on Sunday and the course goes over 3500 miles across the Atlantic. Some of these boats are very fast, so you may be amazed how far they've gone already. Fortunately, ESRI France (ESRI is the maker of the most popular GIS applications) has released a Google Earth file to follow the race . Each boat is armed with a GPS so the race organizers can keep track of their positions and the tracks they have taken. There are quite a few boats in this race, and boats are in several different classes. The leaders are in large 60 foot trimarans which look like this. The official web site for the race has more pictures, news, and race information.